New low-emission buses are being introduced to the jet black service between Newsbury, Thatcham, Theale and Reading. 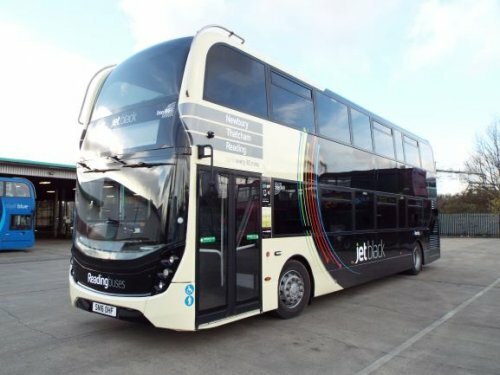 The vehicles will see jet black move into the latest generation of Reading Buses’ style. The main black and ivory colours will remain the same, but the layout and logos will be updated. The jet black logo has a new look with the dot on the ‘j’ changing to a lime colour. The first jet black bus in the new look was introduced week beginning 11 March. Nikki Ball, Reading Buses Marketing and Brand Manager said: “This will tie in with the accent colour on the newly rebranded Newbury & District buses. “It is not just about a new logo, but also our wider values and commitment to running services in Newbury, Thatcham, West Berkshire and beyond. “The seven repainted 86-seater double deck Alexander Dennis MMC vehicles meet the latest emissions standards with Euro VI engines which will help improve air quality. He said Reading Buses had adopted the same philosophy regarding the rebranding of Newbury & District buses, hoping they too would capture the imagination of the public. As the Newbury & District buses were also rebranded in the new look, will also be seen in the Newbury area over the coming months. “We are aiming to complete the whole integration exercise in the summer,” Robert added.